Chibi Craft gives virtually all mobs a new look, much simpler and funnier. 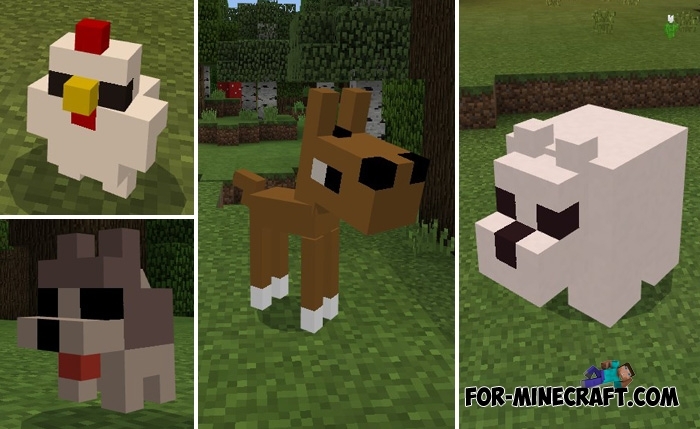 Now all creatures including animals are made of cubes of different colors and only slightly resemble original mobs. It would look like Minecraft if the texture resolution is 4x except for blocks. Probably the main task of Chibi Craft is to simplify and increase the interest in living creatures that the creator wanted to achieve. At the moment, the texture pack supports the latest beta version of Minecraft PE 1.2, but it is still being developed and not all mobs are changed.